*Please note: no guns are to be offered for sale. See vendor application for details. 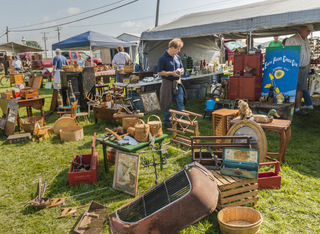 The Shipshewana Antique / Vintage Market & Festival is held rain or shine with 100's of treasures to find under the pavilion and along the sidewalks and on the lawn. The Shipshewana Gas & Steam Engine Show is held in conjunction with this popular event. Parking and admission are free. To reserve a space, a $20 non-refundable deposit per space is due upon submitting an application. All remaining balances are due by June 30, 2019. Full payment is required at time of reservation for vendors who inquire after June 30. All vendors are required to be open by 8 am and stay open until 4 pm. Packing of merchandise can begin promptly at 4 pm. Merchandise should fit within the "antique" or "vintage" theme. The Shipshewana October Antique Market is held the first weekend in October to coincide with the town-wide Fall Crafter's Fair and the opening weekend of the Shipshewana Across the Road Indoor Market. Antique vendors set up under the pavilion at a reduced rate. Download and print an application, or call 260-768-4129 to have an application mailed to you. Questions? Contact us at 260-768-4129, or email us at info@shipshewanatradingplace.com.